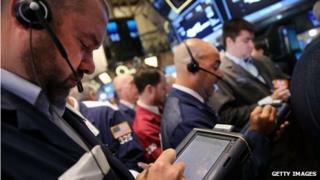 Stock markets reacted volatilely on Friday over ongoing worries about the impact of conflicts in Iraq and Ukraine. European markets were hit by news that US President Barack Obama had authorised air strikes against Islamic militants in northern Iraq. The UK FTSE 100 dropped 1% in early trade before recovering slightly, and other European indexes closed down. But US markets reacted positively, with the Dow, Nasdaq and S&P all ahead. In New York at close, the Dow Jones was up 185.66 points, or 1.13%, to 16,553.93, the S&P 500 was up 22 points, or 1.15%, to 1931.59 and the Nasdaq was up 36.14 points or 0.83%, to 4371.11. The US markets had been boosted by news that Russia was ending military drills near the Ukrainian border. Earlier, Japan's Nikkei index had fallen nearly 3% to close at 14,778, a two-month low. Just as the Asian markets started their trading sessions on Friday morning, US President Barack Obama announced he had authorised air strikes against Islamic militants in northern Iraq but would not send US troops back to the country. He said Islamic State (IS) fighters would be targeted to prevent the slaughter of religious minorities or if they threaten US interests. The Russian government had also announced it was imposing a "full embargo" on food imports from the EU, US, Australia and some other countries, in response to sanctions over Ukraine. As trading got under way in Europe on Friday the major stock markets fell by about 1%, although they then recovered some ground later on. At close of trade, the FTSE 100 was down 0.45% at 6567.36, Germany's Dax was 0.33% lower at 9009.32 while France's Cac was very slightly behind at 4147.81. China's stock market escaped the falls seen elsewhere, with the benchmark Shanghai Composite index up 0.2% to 2,193, after the latest trade data showed a 14.5% jump in exports for July, compared with a year ago. The surge in exports is fuelling hopes that strong external demand will keep the Chinese economy on the growth track for the rest of the year. The latest data puts China's trade surplus at a record $47.3bn (£28bn) for July.